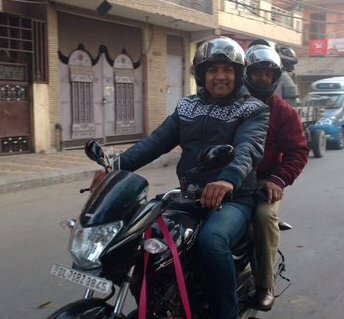 New Delhi, Jan 1: Delhi Tourism Minister Kapil Mishra rode a bike to office on Friday, having decided not to use a solo car during the duration of the odd-even scheme until January 15. On the first day of the car use regulation system aimed at battling pollution, Mishra told that he took 20 minutes to reach the Delhi Secretariat from Yamuna Vihar in east Delhi. “It seems Delhi has accepted the scheme. I am very happy,” he said, referring to the scheme under which odd and even numbered four-wheeled vehicles would ply in Delhi on alternate dates. Valid from 8 a.m. to 8 p.m. daily except on Sundays, the vehicle regulation kickstarted on Friday. “I am not going to come alone in my car for the next 15 days. I will be either car pooling or riding a bike,” Mishra said.